I would like to share some thoughts about a possible new arc. This arc seems to be present on the two observations of Moilanen arc at high source elevation from Jari Luomanen ( 1 ) and Marko Mikkilä ( 2 ). It appears as a diffuse glow below Moilanen arc. This arc can be simulated using any crystal producing Moilanen arc like 34deg prism pointing up (which is not aerodynamically stable) or crystal plates twinned at 34deg (which does not look like a possible twinning) tumbling with large angles along their horizontal axis. As a consequence, this new arc does not help a lot on identifying what crystals cause Moilanen arc. At lower source elevation, the new arc would mix with the usual Moilanen arc so it is difficult to make the distinction between the two arcs. The main difference is that usual Moilanen appears as a hollow “V” while new arc would be more like a solid wedge. This new arc could be responsible of some appearance of the Moilanen arc when it appears as diffuse ( 3 ) compared to more usual sharp arc ( 4 ). To draw a parallel, the usual sharp Moilanen is a bit like the upper sunvex Parry arc while the new arc is more like the upper tangent arc. To the extremes, if the crystals take all the rotational angles, there would be a lower component like the lower tangent arc, or if the source is very high, there would be a complete circle like the circumscribed halo. More observations are needed to confirm the existence of this arc especially at high source elevation when it is clearly separated from usual Moilanen arc, so monitoring about this possibility is encouraged! This is crazy more new unknown arcs. It only keeps getting better. Very clear presentation of the issue. The feature in Mikkilä's photo was recognized at the time, but apparently it was not clear enough to activate but briefly passing interest. Now that you pointed out also similar spot in Luomanen's photo, the issue is getting more flesh. Good catch! More to look for coming winter. I prefer when the simulations are photo realistic. All the halos that we understand can be pretty much simulated with that quality. The sharp arcs in your simulations don't really have similarity with that fuzzy spot in the photos. Small crystals make diffuse halos. The Resolute display that you point out originated from snow blower and near the blower the halos were diffuse and weak, only 22 halo was seen nearby. As I walked further away the halos got more defined as crystals grew (the record of all this can be found from our circular from that year). In my view, the diffuse looks of the arc in that display is caused by crystals that are still rather small. 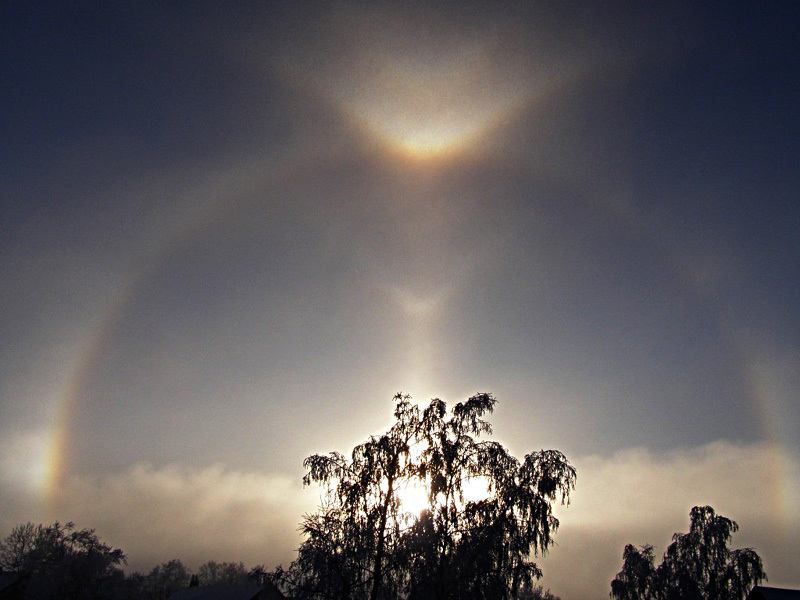 Anybody who has been doing snow gun halos knows how halos are diffuse near the source. And that photo has been scanned from slide, which reduces its quality markedly. 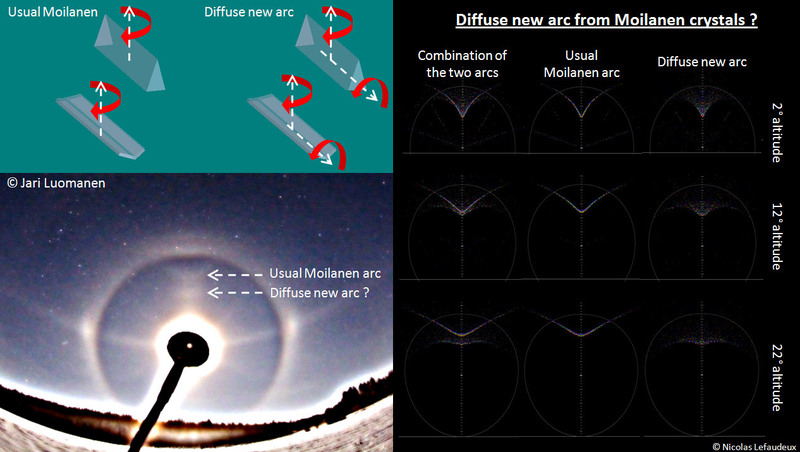 In the circular there is drawing of the actualy shape of this Moilanen arc, drawn as it looks in the original. As you say, the new effect that you simulate shows up at higher light source elevations as well. I would think we would have seen it by now around the high moon in diamond dusts. Or at least found from photos. Many times when we see Moilanen arc in spotlight beam, we don't see it with the moon if it is too high. But this new effect should nevertheless show up. I agree with you Marko, Resolute Bay is not a good example. I have spent a lot of time to find other occurences but could not find any where it shows up clearly. at low source elevation, it is almost impossible to positively identify it because of usual Moilanen or sun pillar at the same location. a third image from Jaako Tähti possibly shows this effect (http://www.ursa.fi/blogit/media/blogs/haloreports/riikonen/Jaakko_Tahti_2301_panoraama.jpg) as a diffuse glow "filling" usual Moilanen. but as you pointed out to me, it could also 'just' be an excess of brightness of the sun pillar. at high source elevation the arc would be absent or extremely faint. This is simulated easily using limited tumbling angles (which is consistent with the absence of the lower component) which causes the arc to vanish with source elevation (http://img88.imageshack.us/img88/4592/newarc.jpg). this is absolutely not surprising, the presence at high source elevation requires very large tumbling angles, this is why i said that "if the crystals take all the rotational angles". the strenght of this arc at high source elevation also seems to depend on the crystal chosen to simulate the effect (this is why I prefer using my own piece of software for the simulations, even if it does not give photo quality simulations, as I can control everything and use really complex crystals). anyway, we still only have two observations which is enough to say this might be a new arc, but we will only be able to draw a general behaviour when more observations will be reported. Marko, another possible candidate for low source observation of this arc is your picture from Himos display on which the wedge aspect is really apparent. I put one of those Rovaniemi (not Himos) photos here, it is more unsmed to give more definition for the arc. Why don't you try frame-to-frame simulation with HaloPoint 2.0 of this Moilanen arc with both "Parry" and "tangent arc" Moilanen. Superpose the simulations and photo as layers in photoshop and see which one matches better. Maybe the arc definition is enough for meaningful comparison. The lens is 16 mm fisheye and sensor size 23.7 x 15.5 mm. Use the first fisheye in the dropbox. Unfortunately there is no time available for that photo to get exact sun elevation, but you could start around 5 degrees. Some years ago I compared this way one display and it turned out as "Parry" Moilanen arc.